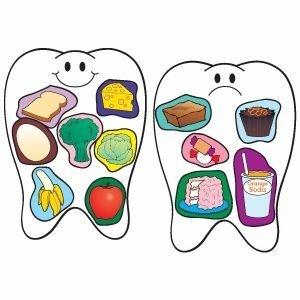 Children need a healthy, balanced diet to help them grow and maintain healthy teeth, but the food and drink choices can also affect the risk of tooth decay and fillings. Too much sugar (for example, from cakes, biscuits, sweets, milk, and other sugary foods and drinks) can cause tooth decay. The length of time these foods remain on the teeth is the main factor that leads to tooth decay. Fruits and vegetables: Offer fruits and vegetables as a snack. Fruits and vegetables that contain a high volume of water, such as pears, melons, celery and cucumbers are best. Limit raisin consumption as they contain concentrated sugars. Cheese: Serve cheese with lunch or as a snack, especially cheddar, Gouda, Swiss and other aged cheeses, which help to trigger the flow of saliva. Saliva helps to wash food particles away from teeth. Avoid sticky, chewy foods: Raisins, dried figs, cereal bars, chewy biscuits, jelly beans, caramel, honey, molasses and syrup stick to teeth, making it difficult for saliva to wash the sugar away. Have your child brush immediately after having these types of snacks. Serve sugary treats with meals, not as snacks: If you plan to give your child any sweets, give them as a pudding immediately following the meal. There is usually an increased amount of saliva in the mouth around mealtime, making it easier to wash food away from teeth. The mealtime drink also helps to wash away food particles on teeth, so choose one that is not sugary. Get your children in the habit of eating as few snacks as possible: The frequency of snacking is far more important than the quantity consumed. Time between meals allows saliva to wash away food particles that bacteria would otherwise feast on. Frequent snacking, without brushing immediately afterwards, provides constant fuel for the bacteria, which leads to plaque development and tooth decay. Try to limit snacks as much as possible and to no more than one or two a day. Brush teeth immediately after eating the snack if possible. If your child likes a drink beside their bed at night, ensure it is water: Saliva reduces while asleep, meaning that there is an increased chance of decay happening if anything sugary is drunk just before going to sleep. Offer your child plain water instead of juice or a fizzy drink: Fruit juices and fizzy drinks contain sugar and all fruit juices or fizzy drinks that say they are sugar free, are very acidic, which softens the outer surface of teeth causing them to wear away and be more susceptible to decay when sugary food is eaten. Water does not harm teeth and aids in washing away any food particles that may be clinging to the teeth. Include good sources of calcium in your child’s diet to build strong teeth: Good sources include milk, spinach and yoghurt.